Very little, if any, discomfort is experienced during the procedure. In fact, the great majority of my clients describe the sensation as a "'tickling" feeling. The anesthesia I use is of a superior grade and is extremely effective. Including the consultation, paperwork, and numbing time, the average length of time for one procedure is approximately 1-1/2 to 2 hours. Permanent cosmetics are permanent in that you will always have a permanent marking on your skin. However, over time, you will notice a gradual softening of color occuring each year. Many women feel that this is advantageous, as they feel that their permanent makeup will age with them. Most of my clients are immediately able to return to work or their other daily activities immediately following their procedure without any embarrassment or discomfort. The blend of anesthesia I use prevents unsightly swelling and bleeding while providing a rapid, healing period for most clients. Each procedure is $250. Touch-ups done within the first 90 days of the intial procedure are $25. Mention my website when you call and get the procedure of your choice for $150. A touch-up is a color re-enhancement. Sometimes the implanted color is not perfect after the first procedure and a touch-up is needed. 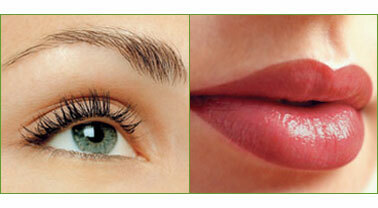 It is recommended that you wait 4-6 weeks for eyes and 8 weeks for lips before a touch-up. in just a couple of hours! FOR YOUR FREE CONSULATION, click the email address or call the number below.